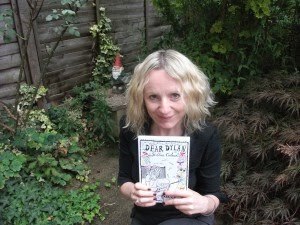 Yesterday I posted by review of Dear Dylan, a book kindly sent to be by Siobhan Curham herself for review. If you would like to read her book for free (and I think you really should) go to her website www.siobhancurham.co.uk where you can download it for free. About the author: Siobhan Curham is an experienced writer and a respected life coach. Her first book was the non-fiction Antenatal & Postnatal Depression, published by Vermillion, which was swiftly followed by a series of novels, Sweet FA, Frankie Says Relapse and The Scene Stealers, which were published by Hodder & Stoughton. She has written and directed for the theatre, is Writer in Residence for 13 London schools and runs weekly writing workshops for two London councils. She currently works as a story deviser and commissioning editor for a children’s fiction development company and lives with her family in North West London. Dear Dylan is her first novel for Young Adults which she self published. Q) What inspired you to write Dear Dylan? A) I've done lots of writing workshops with young people over the years and reading the things that they write about is a constant reminder of how tough life can be as a teenager. I wanted to write a novel that dealt with some of the issues young people face, such as bullying and problems at home. It was very important to me that I dealt with these issues in a realistic and non-preachy way. But I hope that anyone who reads the book who is going through similar problems to Georgie will be encouraged and inspired by her. Q) The format of your novel is quite unusual. Why did you decide to write the novel in email format throughout? A) I read a magazine article about a woman who was a teenager back in the sixties and an avid fan of the pop band The Beatles. She started writing fan letters to one of the band members, George Harrison and ended up having a ten year correspondence with the person who was dealing with his fan mail. I thought that this would make a great starting point for a novel and I brought it up to date by making the correspondence email rather than letters. I am a great fan of emails as a form of correspondence; I think they allow people to really open up to each other and can enable you to become very close very quickly, which is exactly what happens with the two characters in the book. I also like to set myself challenges as a writer and a book constructed entirely of emails seemed like quite a challenge! Q) Describe your main character Georgie. A) Georgie was very loosely based upon a girl who came to one of my drama workshops; someone who had been through an awful lot in her life and yet remained eternally upbeat and optimistic. I made her a real chatterbox too, so it was a lot of fun writing in her voice. Q) The relationship between Georgie and Nancy is quite an unusual one. Despite being seemingly worlds apart in their ages and backgrounds it works and works both ways as they seem to gain from each other. Why did you decide to go with this choice? I'm a great fan of the book 'Goodnight Mister Tom' and the friendship that develops between the two main characters, a young boy and a much older man, during the Second World War. As the mother of a teenage son and someone who has worked a lot with teenagers, I get sick of the bad press young people get. I think that older people can gain a lot from friendships with young people and I wanted to demonstrate this through Georgie and Nan. As an old fogey of forty - or thirty-ten as I prefer to call it - I certainly get loads from working with teenagers. I love their energy and enthusiasm. Q) Which of your favourite authors have you gained inspiration from when writing? A) My current favourite is an American writer called Jandy Nelson ('The Sky is Everywhere'). I think her writing is beautiful and I will often read a couple of pages of hers before I sit down to write in order to inspire me. I also really like Lorrie Moore's short stories and the poems of Carol Ann Duffy. Q) Which five characters from books would you invite to a fantasy dinner party and why? A) Holden Cauldfield from The Catcher in the Rye because I love his voice and this was the book that inspired me to write as a teenager. Aslan from the Lion the Witch and the Wardrobe (although it may be a bit disconcerting having a lion at the dinner table!) I loved Aslan when I read this book as a child and remember crying my eyes out when I thought he'd been killed. Laura Ingalls Wilder from The Little House on the Prairie so that I could quiz her all about her life with Ma and Pa and the girls. Jo from 'Little Women' - another of my childhood favourites. Lennie from 'The Sky is Everywhere' - such a great and interesting character and maybe I could get her to write one of her poems! Q) To sum up explain why everyone should read Dear Dylan in 100 words or less. I guess the main theme of Dear Dylan is that you should never give up on your dreams. Hopefully the book will remind the reader of that and, whatever their own personal situation, they will feel inspired by Georgie to embrace life to the full. I also wanted to make it a page-turner so there are plenty of twists and turns in the plot.